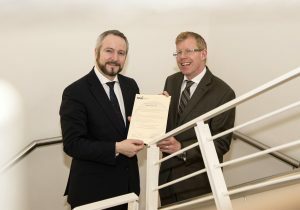 Inland Fisheries Ireland has officially signed up to the Sustainable Energy Authority of Ireland’s (SEAI) Partnership Programme which helps integrate energy management into public sector organisations. As an environmental agency, Inland Fisheries Ireland is committed to improving energy efficiency for the benefit of the environment and the organisation and this partnership will provide a strong framework for success. Pictured were Jim Gannon, CEO of SEAI and Dr Ciaran Byrne, CEO of Inland Fisheries Ireland. Inland Fisheries Ireland has already commenced a number of energy saving initiatives in recent years. These include introducing ‘green patrols’ for fisheries officers where kayaks and bikes are used when carrying out fisheries protection patrols, installing solar panels and insulation on buildings, commencing fuel monitoring and fleet audits, altering lighting and trialling an electric vehicle for future consideration. This new partnership will see Inland Fisheries Ireland follow a clear roadmap with defined actions to help achieve targeted energy savings. The Public Sector in Ireland has a target of meeting energy efficiency savings of 33% and the SEAI programme provides central advice and monitoring services to support all public bodies in their efficiency efforts. Inland Fisheries Ireland will continue to expand on its current efficiency activities and introduce a number of new initiatives including vehicle fleet management in the coming year. As an environmental agency, Inland Fisheries Ireland has long recognised the importance of energy efficiency and this programme will drive its work in this area forward with a view to achieving year on year savings targets of greater than three per cent. The public sector as a whole has already avoided €154 million energy spends through improved energy efficiency in 2015. The sector is now 21% more energy efficient, and is on track to meet the overall 33% energy saving target. Dr Ciaran Byrne, CEO of Inland Fisheries Ireland said: “As custodians of the fisheries resource, Inland Fisheries Ireland recognises the importance of energy management as a highly cost-effective means of reducing greenhouse gas emissions and helping to reverse climate change. Today we have formally committed to reducing our energy usage and our carbon emissions and we look forward to working with the SEAI on reaching our goal by 2020. For more information on Inland Fisheries Ireland, visit www.fisheriesireland.ie or to find out more about the Sustainable Energy Authority of Ireland (SEAI), visit www.seai.ie .